There were only two reviews in Week 3 of MLS, both penalties for challenges. After review, one penalty was upheld and another was given. What Happened: A penalty kick was awarded by the referee for a foul challenge by VAN’s Derek Cornelius on HOU’s Alberth Elis in the VAN penalty area. The VAR on seeing that Cornelius made slight contact on the ball with his right foot before making contact with Elis, recommended a Video Review. 30 seconds: After the incident, the VAR has found three good angles to review the incident: LOW 50, TIGHT and LOW L EZ. 40 seconds: VAR identifies that Cornelius has played the ball first and attempts to contact the referee, who is dealing with the players. 50 seconds: The VAR confirms with the AVAR that the contact with the ball is first and asks the referee if he has called a tripping foul. This is an unnecessary question as the VAR solely needs to determine whether the penalty is a clear error or not, regardless of what type of foul it is. 1:20: VAR recommends a review on the basis that, although the touch was slight, there was contact on the ball by the defender before any significant contact on the attacker and in such circumstances the challenge is almost always deemed to be fair (unless there is a secondary motion by the defender to bring the attacker down having already touched the ball, which was not the case here). 1:30: The VAR shows the referee both TIGHT and LOW L EZ angles at the same time on a split screen. This is not part of our best practices, as when showing in a split screen in the RRA the images are too small to identify details such, as in this case, the touch on the ball. The AR joins the referee at the RRA, although not against protocol or procedures we do not advocate the AR going to the RRA with the referee when the incident is not related to offside. In this case, it just happened to be that the RRA was next to the AR’s position. The referee was not fully convinced the footage showed that the defender touched the ball, and also felt that the defender may have made contact with the attacker before any possible contact on the ball. As such, he retained his original decision of penalty kick. The issue, in this case, is that the Video Review process did not convince the referee that the defender played the ball. PRO’s Decision: Some people may argue that the defender’s slight touch on the ball was not sufficient to negate the possible award of a penalty kick because the ball was still there for the attacker to move onto, before being brought down by the momentum of the defender after the ball had been played. However, we feel the much more credible outcome is for the challenge to be judged as fair, and to award a corner kick. As such, we support the Video Review recommendation and feel that the final outcome was incorrect. 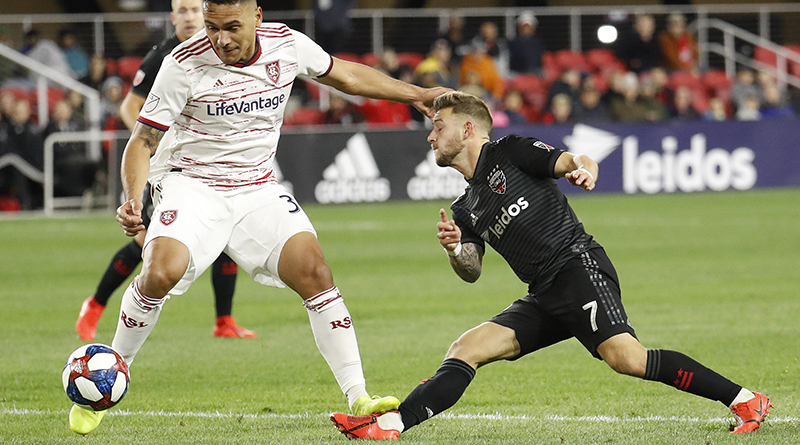 What Happened: With the score at 0-0, DCU were attacking the RSL goal. Paul Arriola of DCU was just inside the RSL penalty area, in possession of the ball. He turned and attempted to move the ball across the penalty area using his right foot. As he did so, he was being closed down by RSL defender Marcelo Silva, against off whom the ball deflected. However, Silva then brought his left foot down onto the exposed foot/ankle of Arriola, after the ball had been played, thereby putting Arriola out of the immediate action as the ball ran towards the goal line, before being cleared for a throw-in. The referee initially did not penalize the action by Silva, but after the ball had gone out of play he checked on Arriola who was still on the ground clearly injured. The VAR checks the footage in order to establish whether the non-award of a penalty kick and the non-award of a red card were clear and obvious errors. The referee suspected that he had missed a late and reckless foul challenge worthy of a caution. Based on what he had seen in his peripheral vision he decided to caution Silva. However, at that time he did not realize that the contact was inside the penalty area. The VAR could clearly see that the contact was inside the penalty area and therefore recommended a Video Review for a penalty kick. The referee looked at the footage in the RRA and having done so awarded a penalty kick to DCU, while also retaining his decision to caution Silva. PRO’s Decision: Although the penalty kick outcome, in this case, is credible as the contact on Arriola was late and had some force, the process undertaken in this case was not good practice by the referee. Having not penalized the offense initially, he should not have cautioned the RSL player until a Video Review recommendation had been made by the VAR. After the showing of the yellow card, the VAR was correct to intervene and advise the referee where the contact had occurred on the field of play which had resulted in the yellow card.